Is Azeez returning to his dangerous missions again? Puchong, 10 Feb: Reading Life of Annie's Food flotilla, Azeez and Anifah, my mind sailed to better days 7 years ago when another Malaysian-sponsored flotilla, the MV Rachel Corrie, headed for Gaza to deliver aid to the Palestinians and a stern message to the Israeli government. Those on board the MV Rachel Corrie, including six Malaysians, suffered more than sea sickness when they were taken in by their Israeli hosts, prompting Prime Minister Najib Razak to thrown diplomatic caution to the wind and slam Israel as "world gangster". The flotilla for Palestine was initiated and partly-sponsored by Dr Mahathir Mohamad's Perdana Leadership Foundation; hence, Mukhriz's deep involvement. 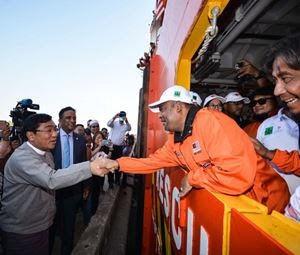 If the Tun and Najib were still friends, I'm sure the flotilla for Rohingyas would bear the PLF's name but since these are not better days, Najib has had to recall Azeez Rahim to sail the choppy waters to Myanmar and Bangladesh to send aid and a stern message to Nobel winner and Asean gangster Aung Suu Kyi. Azeez is an old hand at these humanitarian assignments. Before the Mahathir-Najib split, he'd won the love and admiration of the old man for helping out with the Government's (and his personal) Palestinian cause. I remember a casual media media with Mahathir in those better days, a former editor of an English daily starting running down Azeez (who did not attend the meeting), accusing Azeez of making a name for himself via those humanitarian projects. 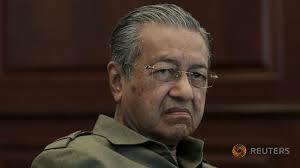 Full of praise of Azeez ..
Mahathir did not hide his contempt for the ex-editor's comments. "At least Azeeeez is brave enough to do those things," he shot back. These days, Azeez does not have Mahathir's affection, for obvious reasons. But with or without the old man, it looks to me that with the food flotilla for the Rohingyas, Azeez is back doing the things he is best at. 7 years ago. 1MDB-Jho Low's Billion of debt (some went missing) haven't hit the fan. Hence that... "prompting Prime Minister Najib Razak to thrown diplomatic caution to the wind and slam Israel as "world gangster". Today... he is quiet like a mouse. Not even a word or twit about Trump's executive orders to ban visitors from 7 Muslim majority countries. Iraq & Libya are the countries the US ruined. Yet, turn a blind eye towards Saudi Arabia whose citizens made-up most of Sept-11 perpetrators. Oh... You're seems to have more balls that Bigdog. I've stop reading what he wrote since I'm no longer welcome there. "Is Azeez returning to his dangerous missions again?" Sounds like a sitcom pilot.